logo done by Raven^NCE :: send your logos to us and be a popstar ! Ohhh yesss. My beauty (even if with a black back-ground)!! !This one contains a COOOOOOOL introtune. Had it on Ghost and Goblins with seperated text-file. Playing with joystick one can change the star-tubes parametres. I still have it somewhere in my intro-collection. This is ABSOLUTELY my favoirte paradox intro of all time. 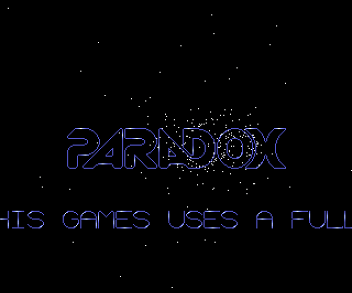 The music in it rules, period, the dot tunnels are ace, the logo and the scroller are just ... I love this one. page created in 0.013445 seconds with 15 queries.